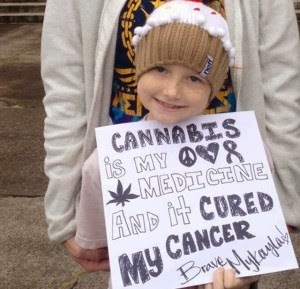 Paediatric cannabis therapy is saving children. Awareness is the most important thing at this moment. The anti-tumor effects of cannabinoids and THC have been demonstrated for quite some time now. In the 1980s, cannabinoid receptors were discovered in the human brain, which made it obvious that our body has to synthesize something that binds to these receptors. Our bodies produce these compounds in our own endocannabinoid system, which is now known to be responsible for a number of biological functions. This is why the plant has such a wide therapeutic potential for multiple diseases, including cancer. Numerous studies have demonstrated time and time again the anti-tumor effects of cannabis. Studies have shown that cannabis completely kills cancer cells, and it has a great impact on rebuilding the immune system. Cannabis has the potential to replace a multitude of pharmaceutical drugs, and it remains a mystery as to why human trials are not underway. If you’re looking for these studies, I’ve put multiple links within the article for you to further your research. In the United States, there are only two approved treatments for cancer: radiation and chemotherapy. Scientists have discovered that chemotherapy fuels cancer growth and kills the patient more quickly, yet nothing has been changed. Both are extremely toxic to the human body. Thanks to a growing awareness with regards to cannabis, and its high rate of success with individuals choosing to use it as a cancer treatment, more people are starting to realize the healing power of this plant. Coupled with all of the success stories, are hundreds of scientific studies that prove cannabis kills cancer, it’s really becoming a no-brainer.